Bible, Jesus, Vodka and an Ashtray – What’s your Comment for this Picture? 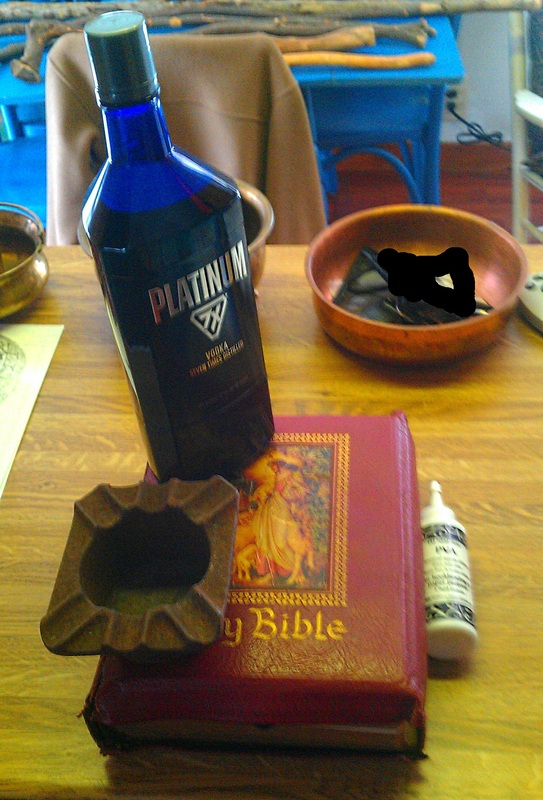 OK this was not staged but just happened because of what i am doing here and then i looked at is and said Hmmm Jesus on the family Bible + a bottle of Vodka laced with real Absinthe essence + an old iron ashtray together. This is a high res pic so if you zoom in to the white bottle on the right you may figure it out. So write me a comment and suggest some good captions for it and then in a day or two if no one has figured out what my project was here then i will revise this post. LOL. I have spent the last two days working on a new FB page, and believe me i frigging Hate FB, cleaning up someone elses page n their 7000 emails at a site they do not use and their WV listing and then deciding WTF i am gonna put up a FB page for the Coven of the Catta just to increase our www footprint. And i have not been on FB in 10 years and gods nothing has changed, nothing has improved, you still can’t drag and drop pics. Arrrgghh. But at least this time i set it up so tight regarding security and privacy…… Oh, that’s right, the NSA is looking at everything anyway so those are just an internet illusion…. Enjoy and good night my blogger friends who have a sense of humour (and i spell it that way because my favourite followers are in the UK, which BTW is a term i hate as Scotland and Ireland and Wales should be separate, but there i got again, another phrase programmed into the NSA humongous servers to red flag me. Yea went back and blacked out my almost illegible drivers license in the bowl, just out of an abundance of caution. Maybe Jesus makes me paranoid. Is knocking at my door like the JWs? What if he comes in? What Would Jesus Do??? This entry was posted in Comedic, My Photography, Religion by Blau Stern Schwarz Schlonge. Bookmark the permalink. For me FB is a neccessary evil, unfortunately it’s where everybody is and it’s a powerful networking tool. I still don’t like thinking about all the individual entities that never came into existence because of or got swallowed by it however. Thanks for commenting on this post. For awhile i thought it offended too many people n almost deleted it. its just my twisted sense of humor as those were actually what i grabbed that were the heaviest to hold that cover down with the book binders glue. and then i went into a rant about FB and internet privacy etc. Take care w your storms n we are going to be whacked tomorrow with what is called a “nor-easter” coming up the coast 8-12 of snow plus sleet.